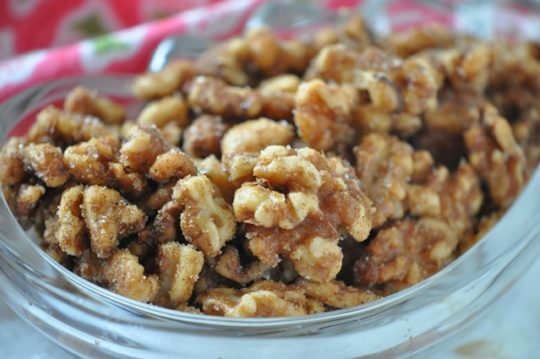 Everyone is obsessed with these wonderful walnuts from Holly Clegg’s trim&TERRIFIC® Eating Well To Fight Arthritis cookbook. They have the perfect touch of spice, heat and sweet. Toss in salads, serve on cheese trays or eat as a snack. Spread walnuts on baking pan and bake about 5-7 minutes or until golden. In small bowl, combine sugar, salt, garlic powder, cumin, cinnamon, and cayenne. In nonstick skillet, heat oil over medium heat. Add nuts and stir to coat with oil. Add seasoning mix, stirring until nuts coated. Remove to paper towel to cool. Recipe from Holly Clegg’s trim&TERRIFIC® Eating Well To Fight Arthritis. For more of Holly's easy healthy recipes, visit her Blog and YouTube channel.